he Annual OQHRA Legislative Dinner has been rescheduled for Tuesday, March 26. 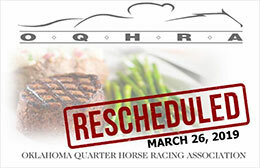 OKLAHOMA CITY, OK—MARCH 18, 2019—The Annual OQHRA Legislative Dinner, canceled last month due to inclement weather, has been rescheduled for Tuesday, March 26. The dinner provides the opportunity for horsemen to meet with legislators one-on-one in a relaxed setting to tell them about how the issues they vote on affect our livelihood. "This is one of the most important events we host each year and we need you to come out and help us help you," OQHRA Executive Director Debbie Schauf said. "We will provide the FREE Steak Dinner we just need you to come visit with them about our industry!" The annual dinner will be held from 5:30 to 7:30 p.m. (CDT) at Heritage Place on 2829 S. MacArthur Blvd. in Oklahoma City. Horsemen and women are asked to RSVP so the association can prepare enough steaks! "Feel free to bring your family, employees, etc.," Schauf says. "It is important the legislators see that our industry supports many." To RSVP please call (405) 216-0440 or email oqhra4@aol.com.